Hi, I’m John Muldoon. Thanks for stopping by! Let me tell you what Conversion Leverage is all about. We’re here to help you get better results from your website. You want to build an audience, sell products and services, and grow your business. That’s your website’s job. My job is to help you do it better. I’ve helped hundreds of entrepreneurs get better results from their websites and blogs; and if you follow the advice on this blog, you’ll get better results too. There are already a lot of places to get advice about building your business. Too many, in fact. But we take a different approach. Instead of talking about cheesy tactics or telling you to spend all your time worrying about SEO and social media(yuck! ), we’re going to focus on the things that really make a difference. No “secret” tactics. No cheesy claims. No BS! Just good actionable advice that really works. That’s our promise. How to improve your website so you have happier visitors and more conversions. How to use the power of leverage to make the most of your marketing efforts. What is Conversion Rate Optimization all about? I wrote a short guide that explains the basics. 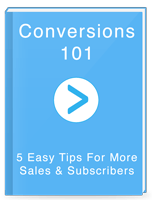 It’s called Conversions 101, and you can download it for free right now. It’s still full of actionable advice, so you can read it and implement some of the advice today to make a real difference in your business. Click here to download it and get started. You’ll also get email updates when I publish new posts, but you can unsubscribe anytime you want.